I am in the process of assembling a business and mission primer for publication in the coming weeks (approximately 45-50 pages). My intent is to first publish it as an ebook but am curious to know what questions folk would like to have addressed. Also, is there any interest in a print version? Some material in this primer is adapted from my book, Eden’s Bridge: The Marketplace in Creation and Mission, but obviously in much less detail and at a much lower price. The aim is to make foundational information more accessible to foster more discussion on the role marketplace Christians have to play in God’s movement in and through the business world. For all practical purposes, our universe is a closed system. Do not think I am discounting the role God’s intervention from “outside” creation plays in human history and destiny. However, creation is an integrated economy. That is to say that everything affects everything else though we may not see the connections between things. But ignorance does not render truth untrue. Because I am simply unaware of the correlation of things does not mean they are not connected, even if by nuance or along a convoluted path. Previously, I have written on “The Value of Reading Broadly.” Great creative thinking comes by integrating great ideas (synthesizing – literally, fusing propositions). Creativity is a hallmark of the presence of God’s activity. But our specializing world tends to undermine creativity on some levels and foster creativity in others. But narrow thinking is not a desirable trait in leaders or followers. The loss of integrative (or, holistic) thinking has been driven by post-Enlightenment scientific categorization, whether in technical disciplines or social structure. We tend to isolate various factors of reality (compart-mentalizing) so that, in isolation, they can be reduced to quantifiable categories and tight enough detail to make them “knowable” to a high degree. Specialization is both a driver and an outcome of the increased complexity of society, especially in the proliferation of the marketplace. Integrative thinking steps back to see a bigger picture of how the divergent things of life connect. Thomas Friedman, in his seminal book on globalization, The Lexus and the Olive Tree (2000), bemoaned this “lack of sight” amidst the increasing complexity of post-modern life, and especially the over-arching nuances of globalization. Electronic communications bring the world to our laptop and we are faced with a breadth of inputs heretofore unknown. Our natural reaction is to simplify news articles to sound bites and headlines so as to not be overwhelmed by or try to capture a comprehensive view of a world that is changing faster than our imagination can keep up. Perhaps, however, one favorable outcome of this inundation of information will be the evolution of human thinking that, given the broad disparity of inputs, will begin to grasp the ecology, the integration, of all things and foster more of what Friedman labels the globalistic perspective. Given too many choices and faced with a multitude of perspectives, we tend to choose to hear what does not disturb us by too many degrees in one sitting. We favor tunnel vision and the rejection of ideas outside our own way of thinking. The only option to grow is to embrace the tension (and humility) that comes from not being able to settle with all the data and the innumerable and indecipherable events that never cease. As a Christian, I take this emotionally and intellectually destabilizing effect and turn it to a positive thought: I cannot control the world nor its influence on my life, so must turn to something or someone outside myself to make sense of it all. For coherence, I find Jesus Christ as the source of hope. My Bible promises that it will all make sense in the end though I may spend my days baffled by the pain and atrocities of a broken world. At least the Bible explains why it is broken and that, though I am not yet satisfied with the state of the world, gives me a sense of peace when I mesh it with the sovereignty of the love of an Almighty God. The path to human destiny has a purposeful end. While I may (and am called to) work diligently to create a better world, I can rest in faith in a good God who can see, understand, and synthesize all of reality toward that better world. The mission of God in the world is the hope of the Kingdom Gospel that we can share with the world, as salt and light, living into that hope and demonstrating the better Way. The world is at odds with God and with itself as self-interest pervades global society. It is not overstating the case to say, outside the Kingdom of God, just as it was with Adam put out of the Garden of Eden, it is every man for himself. But, if we can think (and thinking is one enormous gift of being made in the image of God) and have faith, we can align ourselves with God as He goes about resolving the brokenness of the world by the power and presence of the Holy Spirit in the Church. We need only faith and obedience to follow Christ. God is setting things right, working in and through us to to transform the world. Integrative thinking begins with the reunification of our spiritual self with our temporal self. To be human, at least in this lifetime, is to be a being conjoined. We have unfathomable potential though it is constrained by our sin. We are too often in conflict with ourselves (Romans 7) but we are able, by faith and in Christ (Romans 8), to overcome the constraint of our corrupted flesh. Our temporal self is only temporary but it is out of this constrained state that we can begin to move into Kingdom living, developing our spiritual self, growing in grace, and bearing witness to the glory of God as our actions are brought into subordination to God’s will. Western individualism has contributed to the notion that we are somehow autonomous. We are not. Made in the image of God also means that we are communal beings by design. My physicality, intellect, spirituality, etc. do not function in isolation from each other or from these realities in others. Creation is creation, a unified (albeit, damaged) whole. Hence even the human race is not an isolated function within creation but rather an integral function of creation. Genesis 2:15 does not command Adam to work and take care of creation. The text implies that those are functions of being human by the simple omission of an overt command in the statement: “God placed the man in the Garden to work and tend it.” It is a declarative statement rather than a commandment, but an imperative all the same. The whole point of creation is relationships—between God and us, within the human family, between us and “nature.” Creation has only been dis-integrated in the collective psyche of humankind blinded by sin. But vision has been restored in Christ such that, if we are willing, we can see that the expanses of the universe are built one subatomic particle at a time and it is all joined and held together by the electrical impulse (divine motivation) emanating from the heart and mind of God. This discussion passes into the metaphysical and it should. God is beyond our comprehension and in many ways remains a mystery. But the mystery is tempered by trusting Him as we recall manifestations of His goodness (outcomes of love). With faith in our Heavenly Father, we can reconcile with our wisdom being foolishness (1 Corinthians 3:19) and our righteousness being filthy rags (Isaiah 64:6). God knows . . . we all fall short of His glory (Romans 3:23). But despite our frailties, God opens the door such that we might grow more into His likeness (2 Corinthians 3:18). Our growth includes a change in perspective that we are part of a much greater whole. Our lack of true, godly wisdom should humble us, making us less ready to reject the ideas and beliefs of others as we each come to terms with the degrees of our own shortsightedness (1 Corinthians 3:12). Perhaps as we set aside our attitudes of superiority, isolation, and umbrage, we can see as God sees the kaleidoscopic view of creation, of each other, of the many expressions of the Church, and of the hope of the redemption of all creation. Perhaps we can begin to see beyond the distortions of our own views that which has never been disintegrated in fact. God’s renewal of creation is the renewal of ourselves, that we would live into the very good God created in the beginning – whole, integrated, perfectly functional, without death, or pain, or tears: paradisio for the family of God – His Kingdom on earth as it is in heaven. Integrative thinking will lead us to a deeper understanding of the “otherness” (holiness) of God, and more effective witness and ministry to the world. Addendum: Out of my pursuit of integrative thinking, I blend my thoughts of particular disciplines with devotional or contemplative essays. All is one in our relationship with God. Some question how a devotional (or meditative, or theological, or reflective) piece is relevant amidst discussions of business as mission or outreach ministries. It is precisely that God is in the midst of those discussions that reflection is of utmost relevance and importance. I have a growing appreciation for those who delve into Christian mystical thinking. I belief that mystery is the significant aspect lost to the pragmatism of much of the Church. We work according to our plans more often than following God’s inspiration. God inhabits His movements. There is no separation between the spiritual and practical. My hope is to help infuse our work with resting in God, knowing that it is not we who deliver salvation but God working in and through us as the hope of the world. I do many practical things which, at least momentarily, distract me from their spiritual reality. But as I reflect between those activities, I am finding more of God within the activities. These insights often come in conversation with or reading the thoughts of others. I often find connections between my faith and my temporal being through a diversity of reading both Christian and non-Christian texts. Awareness of those connections, as understanding grows, lighten the burden of His yoke (Matthew 11:29-30). It is only with a great struggle that I shed the driven nature of our ungodly, driven culture. But Adam’s work before the Fall was without toil or the sweat of his brow, the ground was not cursed, producing thorns and thistles, and Adam lived without fear of death (Genesis 3:17-19). Even if we cannot understand, though it is worth the time amidst our busy-ness to slow down enough to think about God, “restfulness” is the truth of God’s restorative Kingdom for those who believe. My prayer is that by becoming more aware that God wants to spend time with us, rather than to be our taskmaster, we can find a way to integrate our conversation with Him and with each other . . . to see a grander vision of who God is and His presence and centrality in every moment. God calls us to become like children (John 1:12). When we cry out Abba, Father (Romans 8:15), it is as a child unburdened by the assumption of our ability to resolve the perplexities of life. It does not absolve of us the work we have been given but it removes the laborious nature. It is not toilsome but rather with the joy of childlike play, knowing we serve purposes beyond the work itself, beyond the outcomes as ends unto themselves, and a God beyond ourselves. It is for this joy, this unburdened freedom, that we slow down, or even stop (Psalm 46:10), to know and hear God amidst our calling and work. Otherwise, all that we build is our vanity (Psalm 127:1). “In all your ways acknowledge Him, And He will make your paths straight”– Proverbs 3:6. “Delight yourself in the LORD; And He will give you the desires of your heart” – Psalm 37:4. “But seek first His kingdom and His righteousness; and all these things shall be added to you” – Matthew 6:33. Spending time with God should come before work. Intimacy with God precedes any worthwhile fruitfulness we bear. But Immanuel, God with us, abides as we work. The reality of God is integrated with our own, and with all we are and do . . . and with all others created in His image. Abandon I-they. In Christ, we are re-integrated as one body: We. Does your work work for the We of God and His creation, the integrated Kingdom of every tribe and tongue and nation? Collins, Kenneth J. “Spirituality and Critical Thinking: Are They Really So Different?” Evangelical Journal, 16(1) (1998): 30–43. The relevance of the Christian faith in Western Europe is easily detected in socio-philosophical discussions when those societies are regularly posited as post-Christian. While the influence of the Judeo-Christian heritage remains in many public institutions, the further transformation of society has languished as it has succumbed to the worry of the world and the deceitfulness of riches (Matthew 13:22). 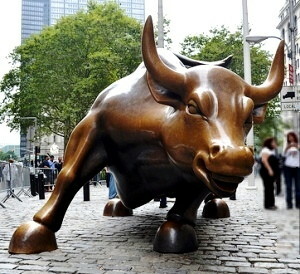 These influences are affecting the Church in the United States as well as our society pursues government intervention to resolve social ills or worships the golden calf (bull statue prominently displayed on Wall Street just north of Bowling Green Park in Manhattan) as our deliverance from evil. I explore the indictment of Tyre (Ezekiel 28) at some length in my book, Eden’s Bridge: The Marketplace in Creation and Mission. “By the abundance of your trade You were internally filled with violence (chamas)” – Ezekiel 28:16. Chamas (Strong’s 2555) is most often translated in the Old Testament as violence (as maltreatment) but also means malicious, cruel, and pertains to unjust gain, all implying to wrong someone else. Much of the Christian faith in the United States has fallen victim to self-delusion and is practicing what Paul labels as holding to a form of godliness while denying its power. It is a false religion. The social ills remain in our midst because the Church in the United States has bought into a false religion, one with no power. We cry out to God but our nation continues to slip into depravity. So then, why is God not answering our prayers? I often hear zealous Christian rail against this thing or that proclaiming their right to be righteously angry, yet their lifestyles and choices simply reinforce the systemic evil that has cut off the poor and marginalized in our society. Gated-communities do not good neighbors make. Are we, as the Church, even willing to hear the cry of the poor, the indicting cry of the Prophets and our Christ? Are we ready to take real action to demonstrate to the world that the way of the Cross and the love of God is real and better than the false security of the world and our transitory wealth. Look around. We are living a false piety, a form of godliness with no power, based on bad theology. We must be willing to hear God’s voice and be willing to submit to His leading. WE must change to change the world. Paul says “But whatever things were gain to me, those things I have counted as loss for the sake of Christ. More than that, I count all things to be loss in view of the surpassing value of knowing Christ Jesus my Lord, for whom I have suffered the loss of all things, and count them but rubbish in order that I may gain Christ” (Philippians 3:7-8). Economic language has been in use concerning the Christian faith since the earliest days of the Church as evident in the New Testament. “For you have been bought with a price: therefore glorify God in your body” (1 Corinthians 6:20). There are two issues at stake here which we understand clearly when economic language is used because our existence is economic in nature: ownership (see 1 Corinthians 6:19 and Psalm 24:1) and value. There is an economic correlation between the Cross and the love of God for creation. Jesus paid that price because He valued His own life less than that of all those would be able to return to God through His purchase. An exchange has been made. As marketplace Christians, whether as workers, employers, or consumers, we often find ourselves confronted with economic questions: how much can I earn?, how much can I gain?, what is the most desirable prioritization of spending my money? These are all exchange questions but they are also all inwardly focused. Typically only after answering these questions do we engage more relevant and sacrificial economic questions: how little can I earn to ensure others can be employed?, how much can I pay my employees without letting the company fail?, what is a “fair” price to support living wages for the producers? Frankly, I doubt that most of us ever ask anything like the second set of questions because they are looking to the interest of others before our own (Philippians 2:4). But the exchange made for our reconciliation with God was made at a very high cost to God. This is the measure of how we conduct our affairs in exchange with others. Painful as it may seem, the bar is set very high. What if God were to ask you to start making all your transactions at a loss? Logic would dictate that we would soon find ourselves in the same boat with the poor. Yet Jesus, pouring out His life for sinners, gave everything He had just so others could benefit. There is a deep theological question that revolves around whether Jesus knew He was divine or not. That He knew He was the Messiah I think is obvious. That He knew He was divine is a harder argument to make from Scripture. In any case, He knew He was fully human. He knew He was flesh and blood. He knew submitting to the will of His Father in heaven was going to cost Him a slow and excruciatingly painful death. Much of modern economic theory is based on the idea that we will do pretty much anything we can to avoid pain. We watch where we walk so we don’t stub our toes. We have also attempted to insulate ourselves from financial worries by stockpiling cash, buying more stuff and house than we can possibly use, and socking away investments for our retirement. What if we were to willingly sacrifice our comfort zone, trusting God that if we “Give, it will be given to us; in good measure, pressed down, shaken together, running over, pouring into our laps. Knowing that by our own standard of measure it will be measured back to us in return” (Luke 6:38). That last statement is the dividing line: “by our own measure it will be measured back to us.” Given the ability to alleviate abject poverty is within the means of the modern world but we refuse by our choices to do anything about it . . . and that shows what we value: our own personal comfort and security over the eradication of enormous suffering. Perhaps that is why the Western world, the marvel of increasing wealth the last five hundred years, now finds itself faced with the comeuppance for the demands we put on government to supply more than our need. For all our wealth, we have continued to expand our own barns and live off the fat of the world. We are the oppressors which the prophets and Jesus warned. In the end, we will either choose to live voluntarily “at a loss,” putting our short term self-worship aside for the sake of the world and the witness of God’s glory, or the choice will be made for us if we continue to oppress the poor. As always, the day of our judgment is at hand . . . invest wisely, with all of yourself, that which God owns. I think my greatest delight yesterday, amidst all the Easter celebrations, was simply in re-reading in Luke 24. Specifically, I was enthralled by those three little words that are, literally, the crux of our Christian faith: “He is risen” (v. 6). But now comes Monday. Reminiscent of the time after Christmas when the torn wrapping paper is cleared away, the new toys, clothing, books, and accessories stowed appropriately, the tree and other decorations taken down and stored for another year, and, after all the festivities, the return to school or the workaday world for another year. What comes after Easter Resurrection? We all, as Christians, have been resurrected in Christ but resurrection is not the end of the story. There is still much to be done. In our resurrection, we receive new life, and that empowered by the Holy Spirit for our transformation from the old, worldly self into the new Kingdom self. God has promised a future and a hope, not just for God-followers but also for the redemption of the earth as God’s Kingdom is already coming “on earth as it is in heaven.” Are you living into that prophetic expectation uttered by none other than our Lord and Savior, Jesus Christ? How do we live into the Kingdom now while waiting with expectant urgency for the culmination of the Kingdom as His return? The Church is culpable for where the world is headed. We have the power of heaven backing us to transform the meta-institutions of the world. There is coming a day when the theocracy of Jesus Christ will be fully established. Until that day, we are to be about changing the status quo. “He is risen indeed.” What are we doing to explain and demonstrate His reign . . . here and now? There is a move of God taking place in the marketplace but thus far it is only a fledgling movement in most quarters. All of God’s people in the marketplace have the opportunity to reach their communities for the cause of Christ. But we have opportunities swelling to reach, and change, the world. How does your faith translate into good news for the poor? As you read this, there are organizations and movements coalescing around the world, seeking to strategize how to be most effective in advancing God’s agenda in the world. Are you taking part? As a researcher, I have the privilege of being perhaps more aware than most of some of what God is doing in and through the marketplace to alter the world’s political economy. I am pressing into more research and publishing that I hope will contribute to a growing awareness of that movement and how we each can take greater part. But know this, the Church, especially those Christians living in the luxury of developed economies, is being called out to engage beyond just doing good in their workplace or hometown. We are challenged to challenge our lifestyles, that we would find ways to invest in the poor, whether financially or by education or by prayer, such that the world will look on the Church as a “wise and understanding people” (Deuteronomy 4:6). But our financial culpability is perhaps the most dangerous aspect of our walk with the Lord. What questions arise for those who hear the cry of the poor and recognize that God is moving in the realms of politics and economics? What information is critical to move us from where we are to where we should be? This post is an open invitation for engagement. I am planning to publish two or three e-books in the coming weeks. One is on the movement in business and mission, a primer of sorts. A second will consider what Kingdom economics look like. Please join the conversation.